Add the ability to connect full-height, half length PCIe cards to your blazingly fast thunderbolt 3 equipped PC or Mac. Thunderbolt 3 offers double the speed of the previous generation and this expansion chassis takes full advantage of the upgrade in speed. The SE I also offers the ability to daisy-chain thunderbolt 3 devices due to the second port - connect upto two 4K displays, a single 5K display or a huge range of peripherals. Are you in the market for a new computer? It’s amazing how much processing power the latest ultra-light notebooks, small form factor computers, and all-in-one desktop computers pack in such small and thin enclosures. But, thinness comes with a cost—there’s nowhere for you to install PCIe cards for the additional connectivity and processing capabilities beyond what’s offered by a computer’s standard ports. Although thin Mac and Windows computers with Thunderbolt 3 ports offer processing power to spare, for many, such as pros in the creative fields, onboard processing power alone is not enough. Fortunately, your choices are not limited to desktop workstations—think external. With the Echo Express SE I - Thunderbolt 3 Edition, Sonnet has created a solution that enables you to connect a single PCIe card outside of your computer. This compact desktop Thunderbolt 3-to-PCIe card expansion system supports one professional video capture, audio interface, 6Gb or 12Gb SAS or SATA host bus adapter, 8Gb or 16Gb Fibre Channel, 10Gb or 40Gb Ethernet, or RAID controller PCIe card, and connects it to your computer through a thin cable. The Echo Express SE I - Thunderbolt 3 Edition features 40Gbps Thunderbolt 3, which offers double the PCIe bandwidth and connectivity of Thunderbolt 2, and yields up to 2750 MB/s of bandwidth, enabling it to support 4K video capture and processing cards at high frame rates, and 16Gb FC cards and dual-port 10GbE cards at full performance. With the ability to handle the most demanding, highest performance PCIe cards, support for connecting two 4K displays @ 60Hz or one 5K display @ 60Hz, and support for a vast array of Thunderbolt and USB devices, Thunderbolt 3 is a leap forward in every way. The Echo Express SE I - Thunderbolt 3 Edition features an x8 PCIe slot, and supports one half-length+, full-height, single- or double-width PCIe card. Double-width? Some pro video and audio interface cards, such as Blackmagic Design’s DeckLink 4K Extreme, and RME’s HDSPe MADI FX card, include a daughter card that mates with and provides additional external connections to the main card. The daughter card occupies the adjacent space without filling a PCIe slot. The Echo Express SE I - Thunderbolt 3 Edition includes two Thunderbolt 3 (USB-C) ports; the first connects it to your computer, while the second supports daisy chaining of up to five additional Thunderbolt peripheral devices to a single port on your computer. The SE I includes 10Gbps USB 3.1 Gen 2 support, meaning you can connect a USB device to the second port using the proper cable or adapter. The SE I also provides full support for connecting two 4K displays @ 60Hz or one 5K display @ 60Hz. For connected devices requiring extra power, 15 watts is provided to connected bus-powered devices. Aluminum and Auto Power IconsThe Echo Express SE I - Thunderbolt 3 Edition’s lightweight, yet rugged aluminum outer shell securely protects the installed PCIe card. Inside, the card is protected through the use of a variable-speed, temperature-controlled fan, which ensures that the card and chassis’ components remain reliably cool. The Echo SE I’s fan automatically speeds up as necessary to cool the installed card when it’s hot, and slows down when it’s cool. Since Echo Express products automatically power on and off with your computer, there is no power switch on the chassis, ensuring you don’t waste energy by forgetting to turn it off. Ultra Quite Fan IconThe Echo Express SE I was designed to be ultra-quiet so that it can be comfortably used in noise-sensitive environments. The airflow path within the chassis has been specially designed to enable the temperature-controlled, variable speed fan to quietly and efficiently cool the installed card at all times, even during peak operation. Designed to accommodate cards up to 7.75 inches long and measuring a compact 5.6 inches wide by 8.6 inches long by 3.5 inches tall, the Echo Express SE I - Thunderbolt 3 Edition has a small footprint, yet it is large enough to support nearly every Thunderbolt 3-compatible PCIe 3.0, PCIe 2.0, and PCIe 1.1 card available. 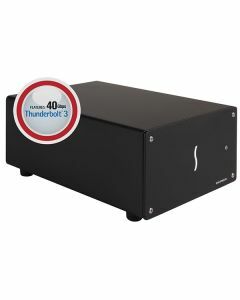 To connect the Echo Express SE I - Thunderbolt 3 Edition to your computer, Sonnet includes a 0.5-meter Thunderbolt 3 (40Gbps) cable, and a Sonnet ThunderLok 3 Thunderbolt connector retainer clip(8) to secure the cable to the Echo chassis. Accidental cable disconnection can lead to data loss. Sonnet’s ThunderLok 3 is easy to install and use—just slide it over one end of the cable, and then plug in the connector and secure it to the chassis by turning a thumbscrew. Because of its unique design, ThunderLok remains on the cable so it won’t get lost when not in use.